Cat nap, anyone? 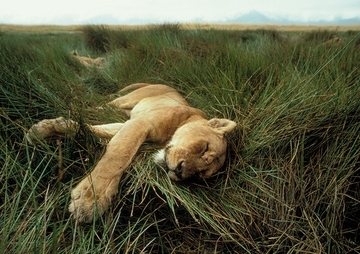 African lions (Panthera leo) sleep up to twenty hours per day. The females of this pride, indulging in a daytime doze on the savanna, will spend their waking hours in a communal effort to defend their territory, their food supply, and their young. Lions are the only cats known to be social, and the cooperative mothering by a pride’s sisters, mothers, and daughters helps ensure their cubs’ survival on the Serengeti.